A black bear spotted early Friday in Horsham Township, Montgomery County was eventually euthanized by the Pennsylvania Game Commission. Several people spotted the bear around 2am behind the Wawa on Route 611 near County Line Road. The bear left the parking lot and disappeared back into the woods. When Game Commission officials caught the bear they had to euthanize the animal due to a sever injury to its back leg. They believe this is the same bear that was spotted earlier this week in Chalfont, Bucks County. 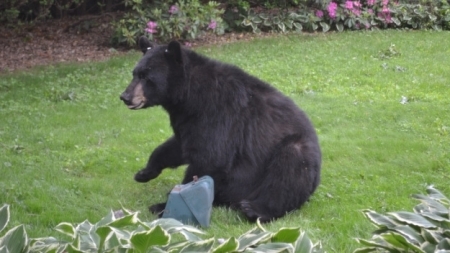 A bear was also caught and put down in Bensalem on Monday. Philadelphia Police have released surveillance video showing a suspect slashing several car's tires in Northeast Philadelphia. The incident happened at around 3:40 am on Thursday morning. The man walked west along the 4200 block of Frost Street in the Holmesburg section slashing tires on several parked cars. In total, six cars were vandalized. He was caught on video by surveillance cameras in the neighborhood. The suspect is described as a white male in his late teens to early 20s, 5’10” and 160 lbs. He was wearing a blue t-shirt and dark-colored pants. Mostly Clear, Temperatures in the low 70's this evening in Center City.